Mold pollution is the growth of molds in a building resulting in damage to or the destruction of the structure itself (or its contents) and adverse health effects on the building's occupants. It is estimated that about 10 percent of U.S. buildings may suffer from mold pollution. Molds, also known as fungi, are microorganisms that generally have threadlike bodies called mycelium and reproduce by producing spores. Spores are generally round or ovoid single cells (but in some cases are multicellular). Spores can be colorless or pigmented and vary in size. While a human hair is approximately one hundred microns in diameter, spore size ranges from one to five microns. There are about fifty to one hundred different molds typically found growing indoors in water-damaged buildings. Water problems in buildings are generally the result of leaks from roofs or plumbing, condensation, and flooding. When building materials or furnishings such as wood, drywall, ceiling tiles, or carpets become wet, causing molds to grow on them. The types of substrates and the amount of moisture will often determine the kinds of molds that grow. For example, some molds like Stachybotrys require a highly water-saturated substrate. For other molds such as Aspergillus, only small amounts of excess moisture are necessary for growth. Thus, moisture control is key to controlling mold growth and eliminating their effects on the building or its occupants. AP/Wide World Photos. Reproduced by permission. may also result from mold pollution, but such health effects remain controversial. Epidemiological studies have linked molds to these conditions; however, a direct causal relationship has not been established. 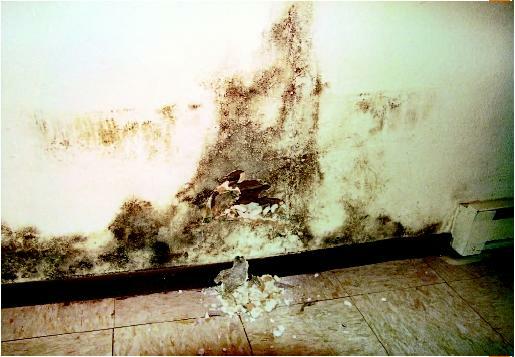 When health effects from molds occur, it is generally as a result of inhaling mold spores. For example, aspergillosis is an infection of the lungs caused by some species of Aspergillus, which can result in difficulty breathing. If left untreated, it can spread through the bloodstream to other organs, resulting in death. It is probably the most common type of building-acquired infection. Individuals with impaired immune systems are most susceptible to this infection. Mold infections can be acquired in health care facilities (nosocomial infections). Careful attention to removing spores from the air and water may be the best method to protect the public from these kinds of infections. Occasionally, mold infections result from animals and birds inhabiting buildings. For example, bats or pigeons may deposit guano containing such molds as Histoplasma capsulatum and Cryptococcus neoformans. Disturbing this guano without respiratory protection can result in infection. The best defense against this kind of mold pollution is to keep these creatures out of the building. In addition to infections, allergic diseases are associated with mold pollution. Asthma is the most common chronic disease of childhood and is the leading causes of school absenteeism, accounting for over ten million missed school days per year. For most elementary school children with asthma, allergens are the primary trigger for asthma, and their disease is thought to result from early exposure and sensitization to common allergens in their environment (e.g., dust mites, cockroaches, and molds). To prevent allergic disease, excessive mold growth must be controlled or eliminated. The elimination of molds from structures requires first that water problems be corrected. Then, the mold-infested material must be removed using proper protection. In some cases, heavily mold-infested structures have had to be demolished or burned. In order to make the best decision on how to treat a mold-polluted structure, it is important to understand what molds are present and in what amount. A mycologist (scientist who studies molds) can often identify and count mold spores collected from indoor air, dust, or surfaces either by culturing them or by observing them under a microscope. However, these are slow and difficult processes. In order for mycologists to improve their knowledge about molds in the indoor environment, mold DNA (i.e., moldgenomes) are being sequenced. Sequencing of DNA is the process of deciphering the spelling of the DNA alphabet that makes each organism unique. Like the sequencing of the human genome, this knowledge of mold genomes allows molecular biologists to develop easier and faster methods for the detection and quantification of molds. This is important because all molds in the indoor environment cannot be eliminated. If molds can be monitored, experts can find out when mold concentrations are at dangerous levels. Measures can then be taken to reduce the mold pollution in the environment. SEE ALSO A STHMA ; I NDOOR A IR P OLLUTION . Heid, Christian A.; Stevens, Junko; Livak, Kenneth J.; and Williams, P. Mickey. (1996). "Real Time Quantitative PCR." Genome Research 6:986–994. Persing, David H.; Smith, Thomas F.; Tenover, Fred C.; and White, Thomas J. (1993). Diagnostic Molecular Microbiology: Principles and Applications. Washington, D.C.: American Society for Microbiology. U.S. Environmental Protection Agency. (2001). Mold Remediation in Schools and Large Buildings. Washington, D.C.: Author. U.S. Environmental Protection Agency. Indoor Air Quality Web site. Available from http://www.epa.gov/iaq . I had a water heater break, flooded the area in my bedroom, closet, closet indoors at water heater and hall/kitchen area. It was replaced and water was extracted by carpet cleaner. A few months later, I found black looking mold inside my closet. I called the apartment manager who sent their maintenance man. He wiped the mold with a rag, sprayed something on the wall, let it dry and painted over the mold. Should this clean-up method be of concern to me?